Iraq Threatens To Cut Off Kurdish Region's Airports After Independence Vote : The Two-Way Iraq's Kurdish region has overwhelmingly voted in favor of independence. Now the Iraqi government says it will block international flights to and from the region's airports in retaliation. Travelers line up to check in at the Irbil International Airport in Iraq on Wednesday. Iraq's government says it will block international flights from the region's airports, a retaliatory move after the country's Kurdish region overwhelmingly voted in favor of independence. 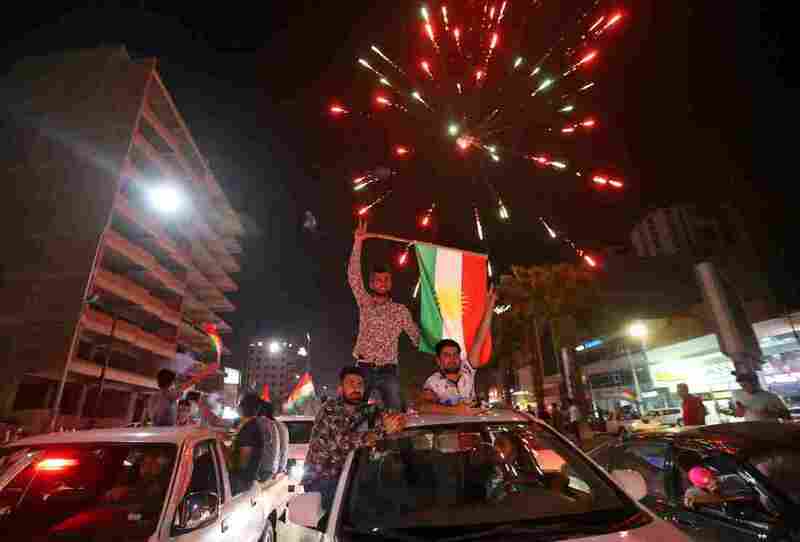 More than 92 percent voted to separate from Iraq, according to results released Wednesday by the Kurdish region's election commission. The referendum results are nonbinding and must be certified by a court, NPR's Jane Arraf reports from Irbil, the region's capital. Iraq's central government and other regional and international powers — including the United States — strongly opposed the vote, over fears that it could destabilize the region and affect the fight against ISIS militants. 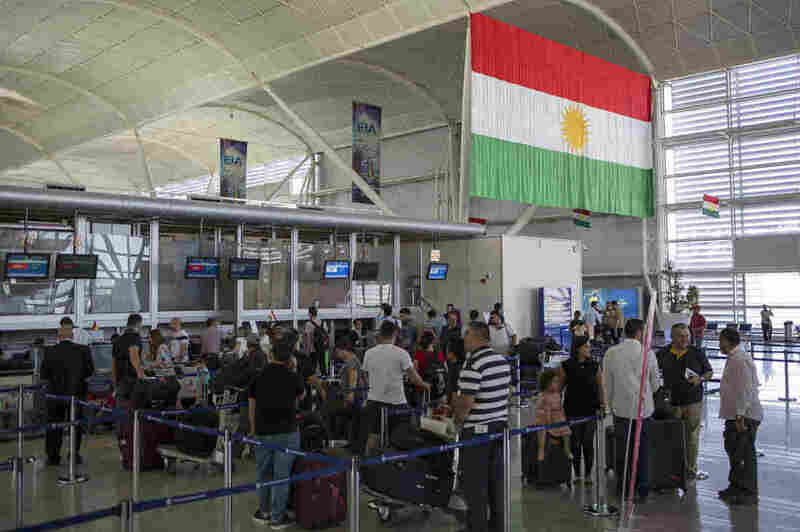 Now, "Iraq has told foreign airlines that starting Friday afternoon they won't be able to fly in or out of the Kurdistan's region's international airports," Jane reports. "That's after the Kurdish Ministry of Transport rejected a demand that it hand over control of the airports to Iraqi authorities." Iraq controls the Kurdish region's airspace, and some international airlines have announced they plan to cancel flights into Irbil, site of the region's largest airport. Iraqi authorities say they will still allow domestic flights operated by Iraqi Airways and aid flights, Jane reports, and the change is "not expected to affect U.S. and other military flights operating out of the military side of the Irbil airport." She says it's worth noting that the vote did not take place under the supervision of international elections monitors, and the region's minority Arab and Turkmen residents largely boycotted the referendum. At a news conference Wednesday, Jane adds, a Sulaimaniyah-based group called "No for Now" described the referendum as a farce and alleged widespread fraud. The group is in favor of independence but believes this was the wrong moment for a vote. It said its monitors were barred from entering polling stations. Kurdish leaders have said the impetus for holding the vote was that it would provide a mandate for entering into talks with Iraqi officials about secession. But in a speech to Iraq's parliament Wednesday, Iraqi Prime Minister Haider al-Abadi said there would "never be a dialogue about the referendum," according to the BBC. "If they want to start talks, they must cancel the referendum and its outcome." Iraq's Kurdish authorities have control of the region's land borders and have their own security forces, the Peshmerga, that has played a significant role in the fight against ISIS. In Wednesday's speech, Abadi called for the Kurdish Regional Government to "hand over control of all border crossings and oil revenues," the BBC reports. U.S. State Department spokesperson Heather Nauert told reporters that the U.S. has expressed "deep concern" and "disappointment" that the vote went forward, but said the airport ultimatum "would not be an example of engaging constructively." The Kurdish area has different visa policies than the rest of Iraq. If international flights there are canceled, it will pose challenges for foreign workers who want to leave but don't have Iraqi visas. Domestic flights will still service Baghdad's international airport, but Jane says that "without Iraqi visas ... foreign workers aren't normally able to transit through Baghdad so there could be a scramble to leave before Friday."